When visiting a dentist, you want to know that your smile is being taken care of using up-to-date, accurate, and efficient technology. You don’t want someone who has outdated, rusty, or inaccurate hardware. 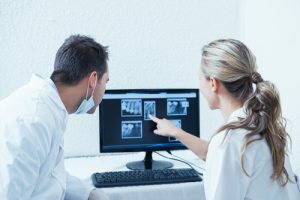 Advances in technology have helped dentists produce better results in shorter periods of time, sometimes eliminating months of treatment for individuals. This means a more comfortable experience in a decreased amount of time for patients like you. Here is some of the advanced technology used for your smile. Getting impressions of your teeth plays a vital role in the process of crafting and designing oral splints or aligners for you. This used to mean using a gooey material that a patient had to bite into, which was less than pleasant for the patient and produced only modest results. These scanners have streamlined the process of attaining impressions of your smile. They use lasers to map your teeth, granting greater precision for the dentist and comfort for you. This piece of technology allows greater convenience for you, the patient, and proves an invaluable tool for dentists, granting them greater diagnostic accuracy. The ConeBeam can fully render a 3D scan of your teeth within 20 seconds while you are seated in an open area. The machine also emits significantly less radiation than a medical CT scan. This digital imagining technology allows your dentist to customize his field of view, allowing your dentist to capture a broader view or zoom in for a more detailed look at a particular area of your smile. Our staff offers expert treatment using the latest in dental technology. Contact us at our local Fort Worth, TX office at 817-236-7846.